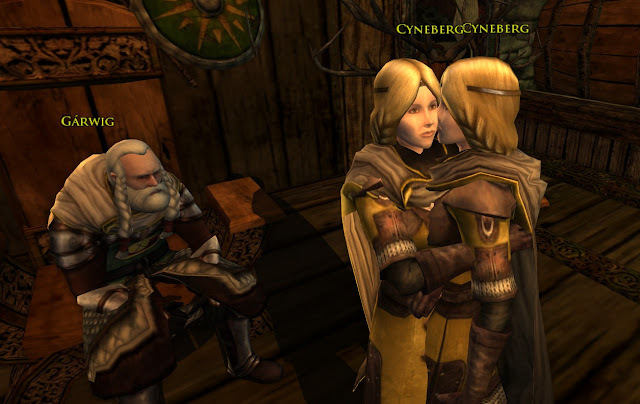 Last week, Update 11.1 was released... forums.lotro.com: Update-11.1-Release-Notes. "New travel skills have been added to the People of Wildermore Barter NPCs to quickly take players to Forlaw." "Thanks to your friendship with the People of Wildemore, you're able to quickly return to Forlaw in Wildemore." Yay! I do like travel skills. As the Update note indicates, you can now get Muster/Guide/Return to Forlaw from the barter guy in Forlaw. The cost is 50 tokens for hunters and wardens and 100 tokens for everyone else to get the "Return" skill. Either way, it is a good deal if you are travelling in Wildemore. I looked at my travel skills list and made a table for those looking to gain more travel skills. Note that each Return skill uses a Travel Ration and each has a 1 hour independent cooldown. With this set of skills, it is easy enough to fly around Middle Earth. The stable masters fill in the gaps to get to remote places, but the Return skills put you near the action. Here are my Travel skills and how to get them for yourself (not counting milestones and home ports). 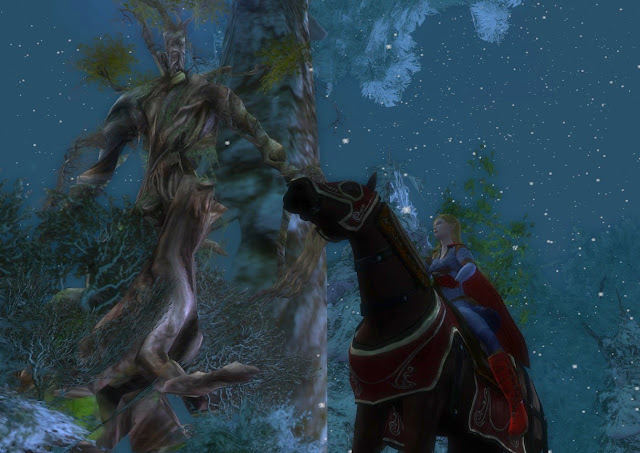 Return to Bree is available to races that are not Man. Race of Men cannot barter for this return; their return is a Racial skill. 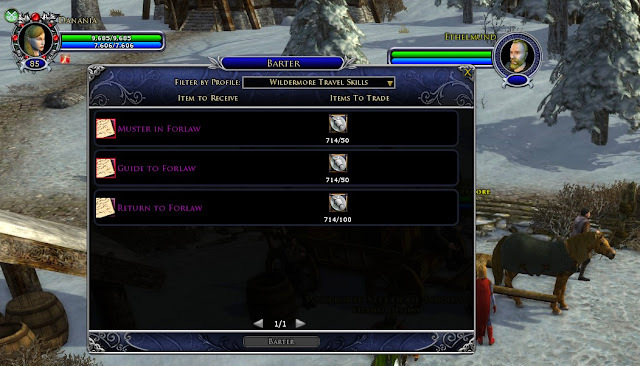 Return to Thorin's Gate is available to races that are not Dwarf. Similar to Bree, dwarves cannot barter for this return; theirs is a Racial skill. Interestingly, I cannot fly to the Shire as easily. I have to fly to Thorin's or Bree and ride the quick horse to Michel Delving. Shire travel is for hobbits only apparently. Of course, we elves are snobbish and cannot let just anyone Travel to Rivendell so quickly. Return to Rivendell is the Elven racial travel skill. I have not bought one of these, but I am told that there are Return Skills to Bree, Thorin's Hall, Rivendell, and Michel Delving sold in the lotro store for 295 TP. That might come in handy if you need your racial trait for something other than a travel skill... or of course, to fly directly to the Shire or Rivendell. * The Precise Map to Glan Vraig in the Ettenmoors is NOT actually a Return skill. It does not consume a travel ration, its cooldown to use is 30 minutes versus the hour for Return skills, AND it is an actual reusable map that you carry in your inventory. It would be much better if it did not have to be a carried in inventory item, but there it is. If you are very new to the Ettenmoors, there is also a Tattered map to Glan Vraig, usable once per day, but requiring only Rank 1. When we started, Ms. Lilly and I, we bought a Manor House in the Shire. The world was rather much smaller then. We visited Ered Luin, Breelands, the Shire, and the Trollshaws. My first trip to Rivendell at level 12 (I just couldn't wait to see it.) seemed so long. Now we are all in Snowborne - 5 of us. Travel has become a real puzzle sometimes. You easy chart of where and how to get quick travel is a tremendous help. I do wish that Brasse would update her travel map. That was really handy. Oops, there was also this place called Angmar then. We didn't like it. @ Digger... I am glad it could help! Not that it is a big deal, but if the designers were looking for more travel skills to add, there is really nothing going North! 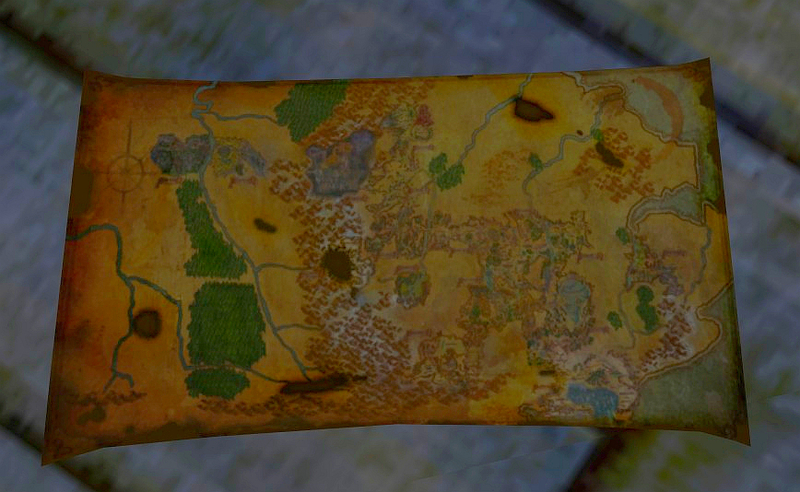 Unless I missed something, there is nothing heading that way, toward Evendim, Forochel, North Downs, or Angmar. ... and I know how much you wanted to get back to Angmar!